Posted on January 23, 2017 at 12:00 pm. For anyone wanting to train as an actor, it can be hard to know which kind of training to choose. One of the first questions you need to ask yourself is, what kind of actor do you want to be? There are a number of different popular acting techniques you can learn, so how do you know which types of acting are right for you and your career ambitions? When making your decision about the type of actor you want to become, you need to think about the types of acting you want to do – theatre or TV and film? Comedy or drama? You then need to assess the different acting techniques and work out which is the best fit for the requirements of your chosen type of acting. Crucially, you need to find out what directors and casting directors are looking for when hiring actors for the kinds of roles you are interested in. To help you make a decision, we have taken a look at some of the most popular types of acting so you can see what they have to offer. This style of acting can be seen as the root of pretty much all modern acting. The System, sometimes referred to as “classical acting”, was developed in the early 20th Century by Konstantin Stanislavski, one of the most acclaimed actors and theatre directors of his day. His aim was to take the knowledge the most elite actors he had worked with had acquired by trial and error over a lifetime in the theatre and break it down into a methodology that could be taught to students. That way, students could quickly become consistently excellent performers without having to spend decades learning their craft. Before Stanislavski, actor training had mostly focused on vocal and physical training. Stanislavski’s revolutionary idea was to help actors develop their inner life so they could produce more grounded, realistic performances. He wanted actors to really feel the emotions their characters were feeling each time they gave a performance. Students of the System are required to become proficient at studying and understanding scripts, so they have a clear idea of the emotions their characters are feeling at any given moment. They then need to be able to consistently summon up those same emotions in themselves on demand. The System therefore has a heavy focus on script analysis and techniques for stimulating the actor’s emotions. Although the System was first created with regard to the theatre, it became popular with early film stars as the subtler, more nuanced performances it produced were ideal for the close-up acting required on camera. It is still used by some modern stage, film and TV actors, although has mostly been superseded by more modern equivalents, such as the Method. Famous practitioners of the System include Sir Alec Guinness, Orson Welles and Basil Rathbone. Michael Chekhov was a Russian-American actor and director (and nephew of the famous playwright Anton Chekhov) who studied under Stanislavski before going on to devise his own approach to acting. Chekhov’s techniques also focused on actors creating a rich inner life for their characters, but relied more on imagination than using real experiences. Chekhov’s approach relies heavily on developing the physical side of a performance, moving away from Stanislavski’s more restrained “real” style towards something bigger and more demonstrative. While the Chekhov technique is still concerned with achieving emotional truth, it relies on the cumulative life experiences of the actor to fuel their imagination, rather than recalling specific experiences to generate each specific emotion. Considered by some to be a less subtle approach to acting than the System and other modern methods, Chekhov’s techniques were still highly popular within the mid-20th century, used by actors such as Marilyn Monroe, Yul Brynner and Clint Eastwood. It is now more commonly used by stage actors than on screen as its more demonstrative style suits certain types of theatre acting. Devised by Lee Strasberg, the Method was initially based on Stanislavski’s System, offering a more advanced, modern expansion on Stanislavski’s techniques. As TV and film were increasingly becoming the main media for professional actors, an approach to acting that worked particularly well for the requirements of these media was essential. The Method’s enduring popularity is in large part down to its versatility, allowing actors to produce exceptional performances both in theatre and on film. Like the System, the Method puts a lot of emphasis on developing an actor’s ability to really feel the emotions they are required to portray. By refining and building upon Stanislavski’s ideas, Strasberg was able to come up with advanced techniques that actors could use to reliably produce real emotions with a depth and nuance unmatched by other acting techniques. Strasberg devised many innovative techniques, such as affective memory, sense memory and substitution so that any actor, with sufficient training and effort could learn how to produce elite-level performances. The Method also teaches key practices such as speaking out and private moment, which help actors take their skills effectively into a professional performance context. This is particularly important for professional actors as it means they can deliver the goods on stage or in front of a camera, not just in a classroom! Method acting continues to be taught and used by actors all over the world, including some of the best-known names in the industry, such as Robert De Niro, Meryl Streep and Leonardo DiCaprio. Another student of Stanislavski’s System, Stella Adler was also involved with Lee Strasberg’s Group Theatre where she learned about the Method and took on board many of its core ideas. However, like Chekhov, Adler preferred to focus on using the imagination, rather than real experiences, feeling that this was sufficient to produce realistic performances. Adler’s teaching requires students to put a lot of time into developing the physical and vocal side of their performance, producing actors who are often very proficient at creating realistic body language and strong vocal performances. As with the Method, she also taught her students to develop the link between their senses and their emotions, understanding that senses like smell and hearing have a strong, instinctive connection to our emotions. Well-known adherents to Stella Adler’s school of acting include Marlon Brando, Salma Hayek and Warren Beatty. A student of Lee Strasberg, Sanford Meisner, produced his own variation on the Method. The Meisner Technique has a very strong emphasis on improvisation and works on a basis of focusing your attention firmly onto the person you are acting with. The idea is that, by carefully paying attention to your acting partners real behaviour, you can react truthfully to them. This means that you are, in a sense, not acting, but simply reacting honestly to your co-star. The one downside with this approach is that it means you are highly reliant on your co-stars in order to be able to give a good performance. Unlike the Method or the System, where your inspiration comes from within, the Meisner Technique requires you to take your inspiration from other actors. This can lead to very naturalistic, truthful performances when two or more highly skilled actors are working together, but can also lead to less reliable results than other approaches when working with less adept co-stars. Because the Meisner Technique relies so much on improvisation to create a good performance, it is perhaps most suitable for the theatre where there is often more time for a lengthy rehearsal process. Famous students of the Meisner Technique include Grace Kelly, Gregory Peck and Peter Falk. Devised by American actress and director Viola Spolin, the “Theater Games” [sic] is a series of improvisation games designed to help actors develop their improv skills for use primarily in theatre acting. Spolin taught actors as young as six with her approach, which emphasises fun, creativity and adaptability. The games involve concepts such as speaking in gibberish, acting like various animals and incorporating emotions suggested by onlookers into a performance. Perhaps unsurprisingly, this approach is highly popular for actors wishing to develop their comedic performance skills. Building on Spolin’s ideas, her son, Paul Sills, was one of the founders of legendary The Second City improvisational comedy group which has produced such notable talents as Bill Murray, Tina Fey and John Candy. The creation of celebrated playwright David Mamet and the actor William H. Macy, practical aesthetics takes inspiration from the work of Stanislavski, Meisner and the ideas of ancient Stoic philosopher Epictetus. “Literal” – what, in the most basic terms, is happening in the scene? “Want” – what does the character want the other character/s they are interacting with to say or do? “Essential action” – what key action is the character trying to achieve in the scene? “As if” – what situation from the actor’s own life can they relate the situation to, to help them find the appropriate emotional response? Practical aesthetics can be seen as a more externalised approach to acting than techniques derived from the System. Although the “As if” approach is also used in Method acting, practical aesthetics is otherwise much more focused on characters’ wants and actions, rather than attempting to create a realistic inner life for the character. Adherents of practical aesthetics are William H. Mac (unsurprisingly!) and Rose Byrne amongst others. Method acting is one of the most popular types of acting and has been used by 80% of Oscar-winning actors this century. By learning The Method, you can become an elite actor, able to deliver results on demand every time. This is exactly what directors, agents and casting directors are looking for in a professional actor, which is why method acting is so popular in the industry. 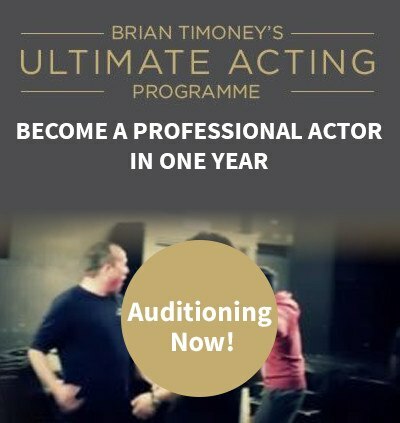 At the Brian Timoney Actors’ Studio, you will learn the Method to a level few other acting schools can offer. Not only that, we also focus on the business of acting, teaching you how to find and win roles and build a sustainable acting career. This is what sets us apart from so many of our competitors – we not only teach you how to act, we also teach you how to get regular paid acting work so you can truly become a full-time professional actor. Our 1-Year Ultimate Acting Programme covers everything you need to succeed as a professional actor, so if you want to turn your acting dreams into your everyday reality, please don’t hesitate to apply today! To find out more or to enquire about our 3-Day Introduction to Method Acting Bootcamp, please get in touch.